Blackcurrent in the Nose of Fine Wine - Aroma Academy U.S.
Every now and then, Dr. George Dodd puts together fairly detailed notes on different aromas prominent in fine drinks. Dr. Dodd has one of a the best developed noses in the world. He’s a professional perfumer and directs the Institute of Olfactory Research at the University of Warwick in Scotland. Here are his notes on the aroma of blackcurrant, which dominates the nose of many red wines, particularly Cabernet Sauvignon. 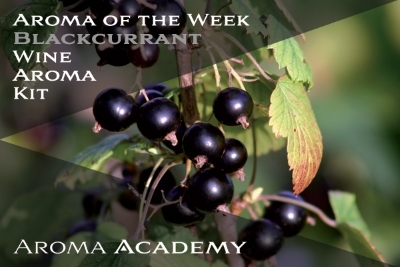 When considering our aroma and flavour categories, It is easy to appreciate that blackcurrant belongs to the sub-division of berry in the general category of fruity. In fact, when you are nosing an unknown red wine, the likely sequence of your mental pictures as you sniff and reflect are likely to be – first, fruity and then – on more sniffing – berry and then on sniffing again you may very well identify the unique blackcurrant aroma note. It is unmistakable when you know it. This aroma note plays such a prominent role in the aroma profile of red wines from some classic grapes, especially Cabernet Sauvigon (CS), and also in Syrah and Merlot (to a slighter extent), that it made sense to give it a distinctive place in our Wine Aroma Kit. Those readers who prefer their technical language in French, will recognize Blackcurrant as Cassis. Anyone who has ever followed the evolution of the flavour preferences of their children as they grow up, may very well have noticed that many young children dislike the flavour and aroma of blackcurrant juice and drinks, but they often come to like them later in life, sometimes when they are adults. This is probably a strong example of the reduction of our smell sensitivity as we get older. Aroma molecules with a distinct blackcurrant note have a well-defined molecular profile. One part of the molecule has a group containing a sulfur atom (usually what is called a thiol group, denoted as -SH), and another part has the characteristic bit of a molecule which is called a ketone group (denoted by the symbol –C=O). Therefore this class of molecules is often called the thio-ketones and even by the most extravagant standards of the Aroma Sciences, such molecules can be really smelly. The tale of the thio-ketones in odor science is a convoluted one and very often, the impetus to investigate such smelly molecules has come from some type of odor problem. It was the occurrence of catty off-odors in tinned meat which first led to studies on thio-ketones. It is interesting that a cat’s pee aroma note is sometimes used to describe a particular odor in Sauvignon Blanc wines. In fact, the scent note in question is not in fact pee, but is actually that of the pheromone spray which a tomcat uses to mark his territory, a strong and powerful odor of a sulfurous nature, not as bad as the olfactory calling card of the skunk, but definitely noticeable in a distinctive olfactory way, as I am sure that many of you know. One of the demonstrations that we sometimes perform when we are holding Perfume or Wine Aroma days, is to present to the audience, two dramatically different (one low, the other extremely low) concentrations of the aroma molecule which we use as our standard for the blackcurrant note. At an extraordinarily low concentration, at which you begin to wonder about how many smelly molecules are actually there, you get the distinctive whiff of a fine blackcurrant drink, and so attractive is this cassis type of aroma, that it is a pleasure to linger and sniff. However, at higher concentrations, it is the aggressive and pungent smell-love charm of the tomcat which is evident, and the smelling strip is rapidly removed from the nose. Yet it is the identical smelly wine molecule, at different levels of smell concentrations, which give us these profound differences in our reactions.